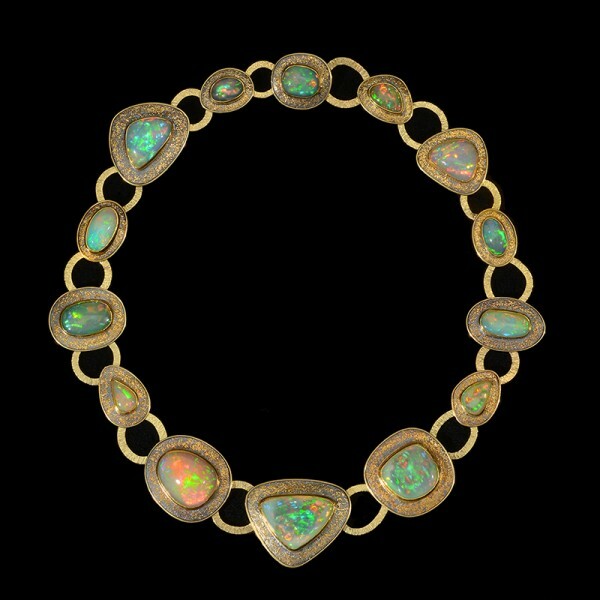 This incredible necklace is made entirely with Wello opals from the Wello Provence in Ethiopia. The white, opaque to translucent opals are volcanic in origin, are remarkably durable and were discovered by farmers in 2008. They are admired for their strength, are much less prone to crazing and are stronger than any other opal. When tested, Wello opals were the only opals not to crack when dropped four feet. In addition to durability, these opals are exceptionally bright, with an incredible amount of fiery color play. An opal is a gemstone consisting of hydrated silica, typically semi-transparent and showing a variety of colors against a pale or dark ground. The stone name “opal” comes from the Sanskrit word “upala” for precious stone. The ancient Romans associated opals with hope and good luck. The opal is said to inspire the wearer’s imagination and creativity. Because opals contain water, they are also said to help balance the chakras, provide improved energy levels, stronger memory, eye, blood and immune system health. This necklace was in the works for a year while the artist selected opals from a gem dealer who personally visits the Wello mine in Ethiopia. Each of the 14 magnificent stones is hand set with a 22K gold bezel and cushioned on oxidized silver with fused 22K gold flecks. These elements are connected with 18K gold links that lend a lacy, light feel not usually found in a necklace with stones of this size. The entire piece is hand fabricated and has a hidden clasp. The rarity of these stones paired with their superb size and quality makes this an impossible piece to be replicated. To purchase or to request more information, please email us at mobiliagallery@gmail.com. Moisture, extreme heat and direct contact with personal hygiene products such as hairspray or perfume can damage this necklace; please store it in a cool, dry place.